Located 10 minutes drive from Cygnet in the heart of Tasmania's picturesque Huon Valley, Windflowers Cottage offers accomodation for rentals of up to 8 people. The neat, self-contained 2 storey cottage and self contained annexe sit in gentle rolling hills with spectacular views across the magnificent Huon River to the majestic and often snow covered mountains of Tasmania's South West. This country retreat is stylishly furnished, equipped to a high standard and loaded with amenities. Accessed by a private road through an olive grove and surrounded by garden, pasture and forest, peace and tranquility are assured. A swimming beach is within walking distance and there is a well equiped gymnasium on site. Enjoy the outdoors with walks in the cottage gardens, olive grove, and protea fields or along the stunningly scenic Cygnet Coast Rd. Venture further afield and enjoy the many coastal, mountain and waterfront drives with which the Huon Valley abounds. The nearby (6.5km) township of Cygnet has restaurants, cafes, boutique shops and galleries. Cygnet, a mecca for artists musicians and craftspeople, is renowned for it's market, held on 1st & 3rd Sunday of the month the Cygnetl Folk Festival held on the 2nd weekend of January each year. Wineries, cider sheds and seasonal cherry and berry fruit farms are open to visitors to enjoy the "fruit of their labours" in the most relaxing and authentic way. The Hartz Mountains and the Tahune Forest AirWalk are an easy drive via the historic boat building township of Franklin. Driving here, no matter which route you choose, to travel, over the Wellington Range or along the D'Entrecasteaux channel offers some of the most beautiful views Tasmania. Great dining is nearby at Mathew Evans' Fat Pig Farm, Home Hill Winery or Peppermint Bay. Hosts, Bruce And Leonie Bailey moved from Sydney in 2012. After 35 years operating a well known "boutique" relocation and storage business in Sydney's Eastern Suburbs, Bruce is now a "gentleman farmer" in Tasmania. Leonie's background was in fashion and design. Bruce's previous experience in a very demanding service industry , , Leonie's flair for design and a shared passion for providing great service is now directed towards making Windflowers Cottage B&B a stylish & comfortable country retreat. Windflowers a 28 acre property of pasture olive groves and Protea plantation is set among gently rolling hills with exceptional water and mountain views. The property offers seclusion and tranquility while still being conveniently close to the village of Cygnet, the regional Town of Huonville and 45 mins drive from Hobart. A bore on the property provides a secure water supply for irrigation of crops and gardens. The fully self contained 3 bedroom cottage has views from all rooms and a spacious verandah. An adjacent apartment with a 4th bedroom is available on request. The cottage is surrounded by an acre of fully fenced gardens and lawn. Pets are welcome and are safely confined in the one acre enclosure Hosts live in a separate house 150 metres away on the same property and are on call if required. Set on a rural property with Olive Groves, Protea fields and Pasture grazed by Highland Cattle. Small sandy beach with grassy area and picnic table. Ideal for children with shallow water, warm water. Quite protected from wind even on cooler days. Parking area. 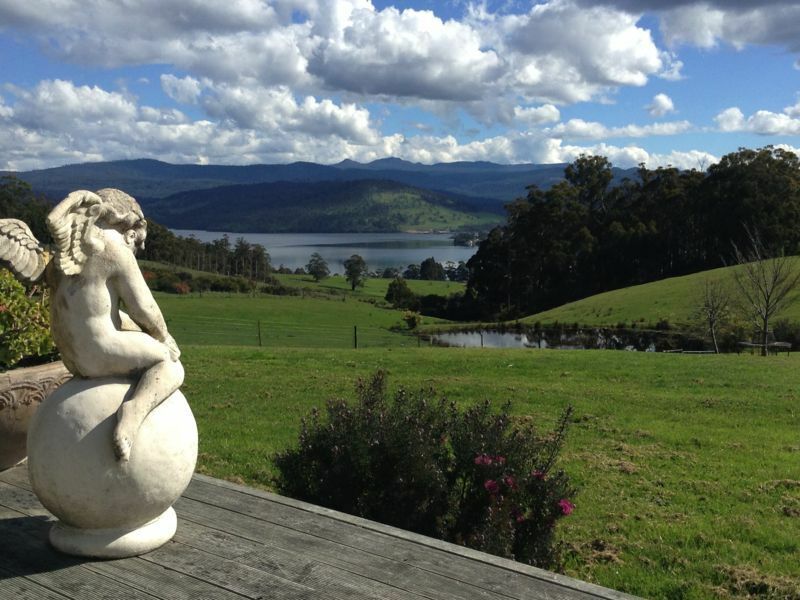 Spectacular views across the magnificent Huon River to the majestic and often snow covered mountains of Tasmania's South West. Carport for 2 cars. Farm can accomodate 2 more under cover. Eliptical walker/climber, rowing machine, fixed weights, dumbbells, inverter, weight bench and more. Glass cooktop in caesar stone centre island. Small library including Tasmanian titles. Cottage Garden and orchard in 1 acre of fully fenced enclosure is safe for pets and set amid pastures and olive groves. We found this house to be very relaxing with all the comforts of home. Your eye is constantly drawn to the gorgeous view from the floor to ceiling glass windows or enjoying it from the deck. The group of us had been to the Fat Pig Farm for the Friday Feast and it was an easy drive so perfectly located. Highly recommend! After an exhausting 4 days walking the 3 Capes Track arriving at this comfortable piece of heaven was just what the doctor ordered. With every comfort thought of (including the Lindt balls) we were happy to stay put until our feet recovered! We were very close to our visit to the Fat Pig Farm Friday Feast which was convenient to roll home and loll around on the grass like fat pigs ourselves! Thank you for sharing your piece of paradise. Just brilliant in every way .. beautiful cottage with absolutely everything you need and some more .. quiet, modern and very comfortable .. will definitely head back there ! We totally loved our time here. This is like the place that you always imagine or dream it could be, but rather than disappointing this place was way beyond what I was expecting ( and I’ve stayed in a few). The house is beautiful, superbly decorated, totally inviting. The view is incredible, completely mesmerising. The garden is lovely and with the totally dog friendly fence- what’s not to love. We loved our stay so much we had to stay longer. It was like living in a beautiful country house in a secluded location- but with none of the hard work! Very generous hosts, delicious eggs fresh from the chooks. The only reason not to recommend would be to make sure this spot was available for us when we are next in tasssie. Thank you so much Leonie and Bruce for a lovely stay. The view was stunning and location nice and close to all the attractions down that way. We brought our dogs which was fantastic and it's lovely to see people offering such beautiful pet friendly places to stay. We would love to come back again one day! Close to Mathew Evans' Fat Pig Farm.